My first time at the “newly” expanded SF MOMA. 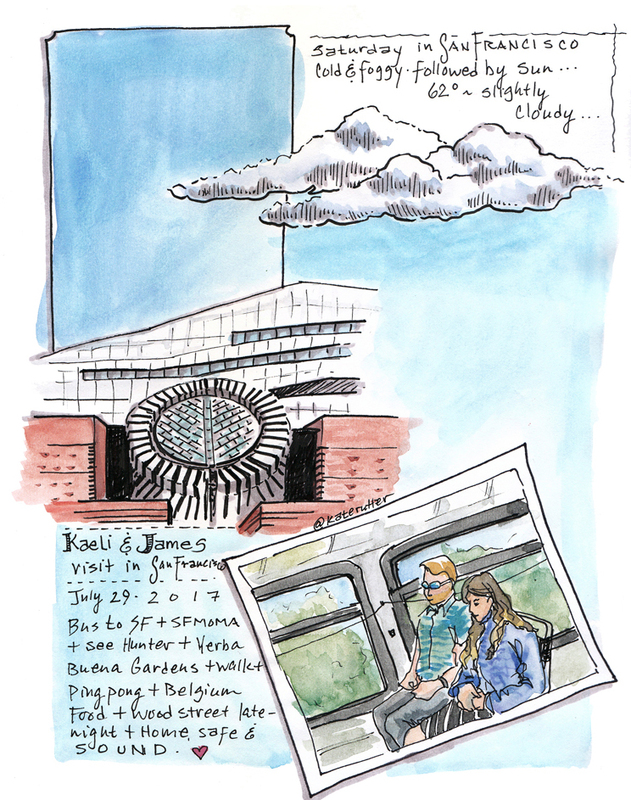 My niece and her fiance are big art and architecture fans, and had the museum as #1 on their to-do list while visiting over the weekend. We spent hours there, starting on the 7th floor and working our way down. From soundscapes to modern to pop to contemporary, the collection just sparkles. Or bongs. The Clinamen v.3 piece was simply lovely. It’s tricky to sketch in a museum because I don’t want to block the art. 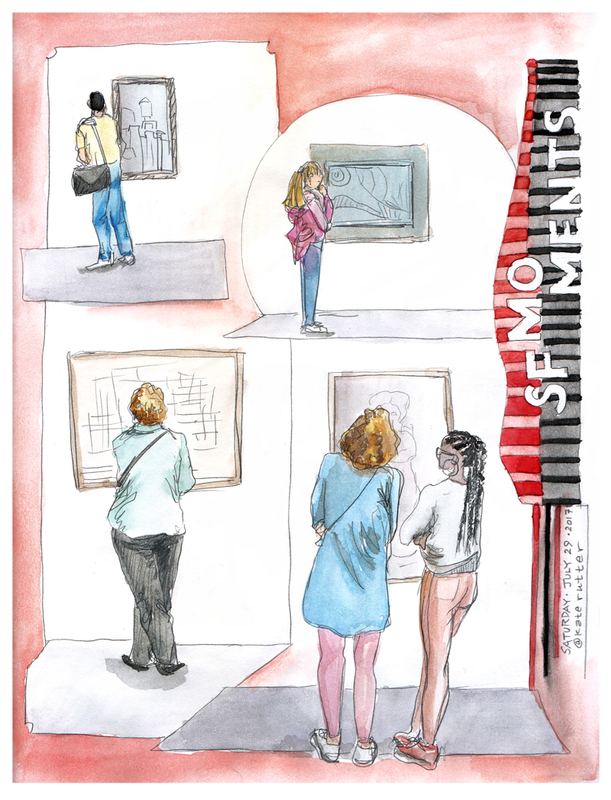 But honestly, the visitors are the most fun of all…I grabbed a few quick pencil sketches (<10 min each) and then later at home, added color and composition elements to bring the memories to life. 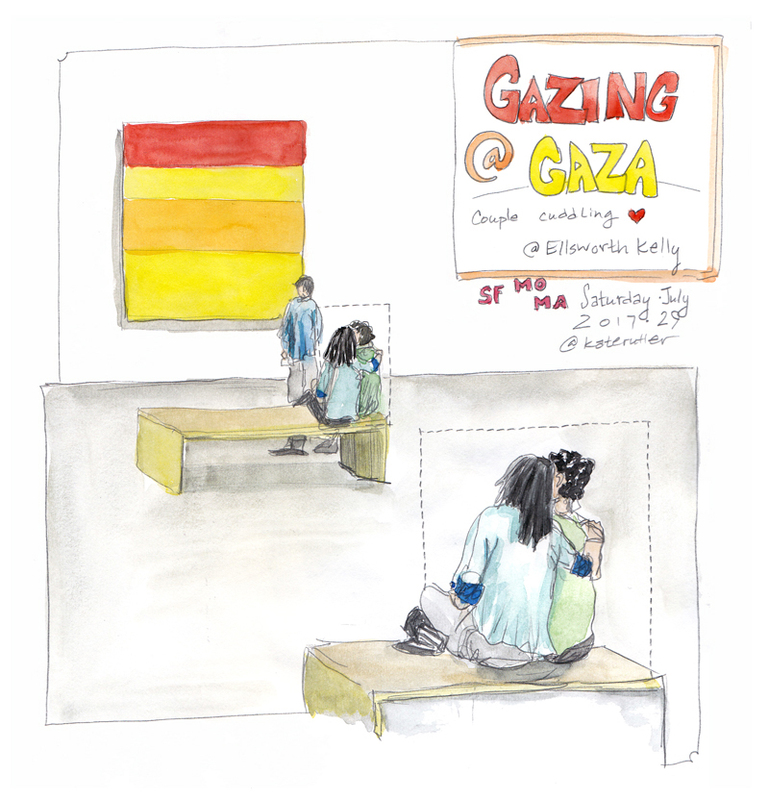 If you visit the museum, don’t miss seeing Gaza by Elsworth Kelly. It jumps off the wall and into your heart. This couple tugged at my heart. They were literally gazing at a piece entitled Gaza. So cute. I loved how her moleskine sketchbook fluttered open on the bench beside her. 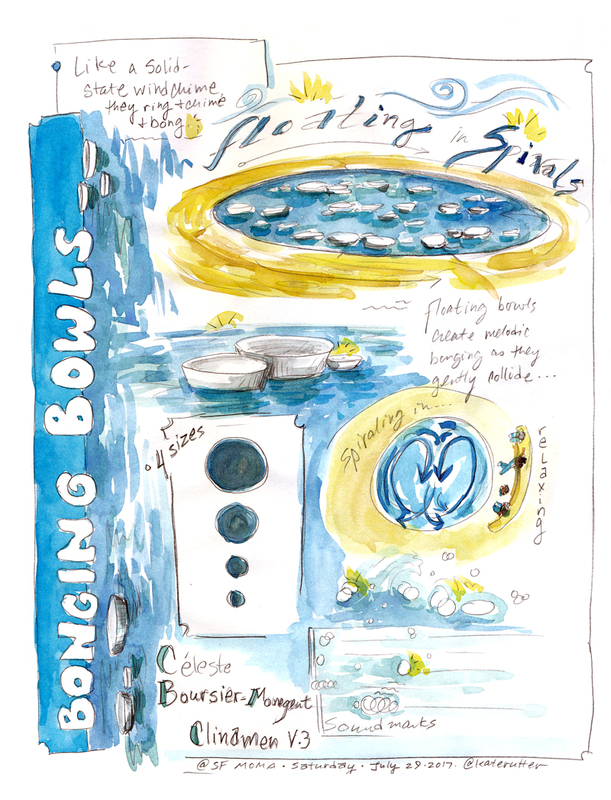 Visual notes for the sound installation Clinamen v.3 by Celeste Boursier-Mongent. Really lovely. 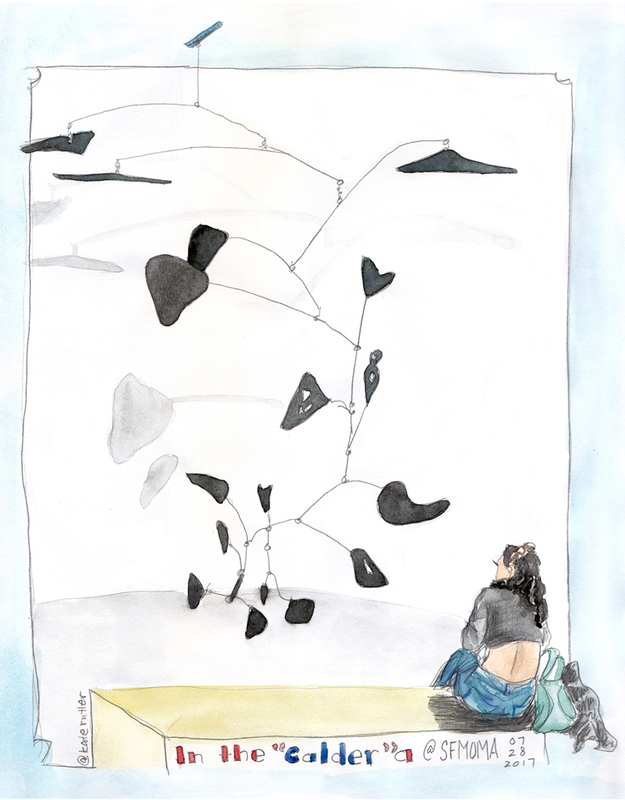 The black floating shapes of the Calder and the black hair and sweater of the woman watching it move just jumped out at me. 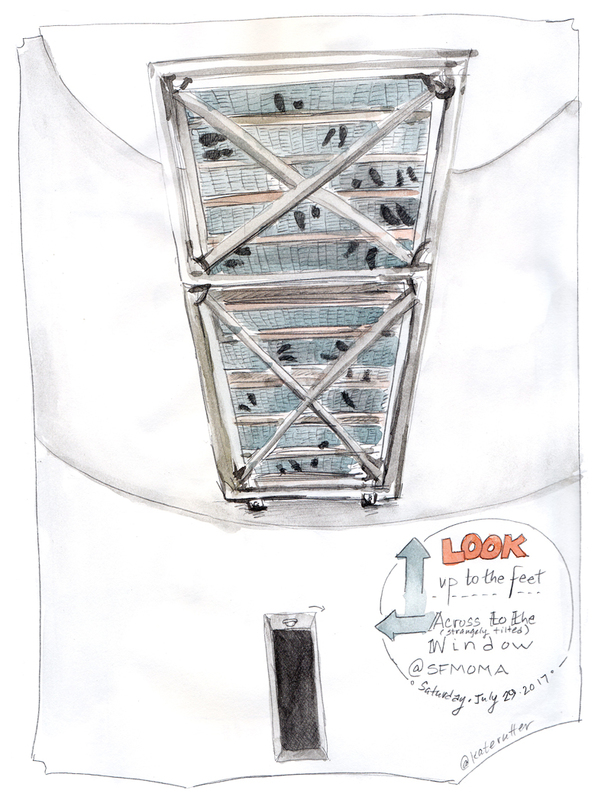 The overhead bridge that spans the atrium is amazing. Looking up from below, you mostly see feet. The visual staccato of the feet on the grate is lovely. Rapid sketching in the modern classics gallery. Love the body postures of people examining the pieces.